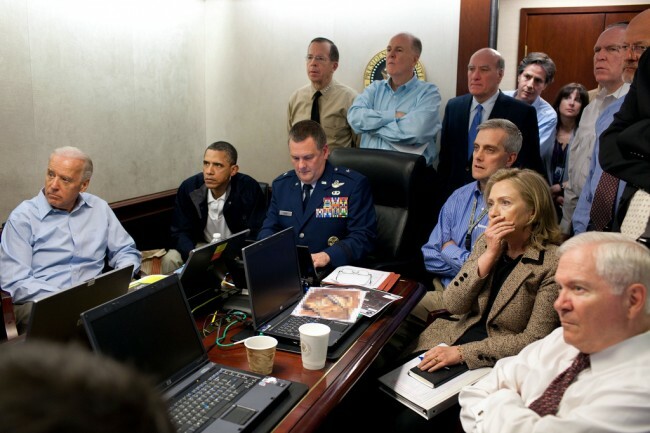 So here we are a full two days after the historic destruction of Osama Bin Laden, and (predictably) the story has moved on from the details of the raid to the political fallout and the Monday-morning quarterbacking analysis of the decision to take out the most evil man in the world. Seems everyone from Pakistan’s President to Nancy Pelosi are getting in on the act. This morning, there are two major threads in the news: whether to release the photos of Bin Laden’s corpse to satisfy the doubters; and President George W. Bush’s pass on joining President Obama at the World Trade Center in New York on Thursday. As of this writing, President Obama is being counseled to not release the Osama photo, for fear that it would provoke a backlash from extremists, who some fear may launch a retaliatory attack in retribution for an insulting act. To me, that’s a little like worrying about the backlash from drug kingpins after the takedown of a top lieutenant. Drug kingpins do what they want regardless of your actions. From a PR perspective, there is no widespread outcry from a credible organization for evidence of Bin Laden’s death at the hands of Navy Seals (props to you guys, BTW). The few people who are doubting Bin Laden was killed are the same people who think 9/11 was faked. I say let them keep surfing the web for conspiracy theories. So in the end, the US would gain nothing, and would even lose some dignity, in releasing a photo that is bound to be difficult to look at. I say take the classy high ground and keep it locked away. You know you got him. And everyone’s opinion you care about knows you got him. That’s enough. On the Bush invite, I know partisans will likely try to exploit George Bush’s choice to stay away from New York as either a slap at Obama (liberals) or a courageous choice to not join a “do-nothing president” (conservatives). Both opinions are silly. I too would have told Bush to pass, and for one reason: this is Obama’s victory lap, let him take it. “W” already had his moment at Ground Zero; this is another president’s turn and message to send. Not joining Obama should be positioned as a magnanimous gesture to allow another president to enjoy the fruits of his very difficult decision and leadership, not as petty or partisan. It had been a while since I visited web site with such high capability information. Thansk rather a lot for the beneficial info. I see your website on google and read a some of your other posts. I just added you to my Google News Reader. Keep up the good work Look send to reading more from you in the future.